The Best WeWood Watches Reviews with Top Rated User Reviews from Actual Users. The WeWOOD watch brand is an Italian watch brand established in 2009 in the city of in Florence known for its creativity, art and beauty. WeWOOD is an Italian watch company leading the forefront for ecologically sustainable design of unique and custom built timepieces, emphasizing the need for greater care and thought for our beautiful planet. WeWood has with astounding creativity managed to be the first to create wrist watches from wood. If you’re looking for a unique watch, then the WeWood watch collections definitely qualify. These watches are made with an outer that is 100% made of wood whilst delivering precision details, comfort, and high-end movements expected from a luxury timepiece brand. Each WeWood timepiece is unique as each watch is made from a grain of wood with its own peculiar shades and subtle tones giving a personalized handcrafted elegance which no other watch can match. Most importantly if you’re concerned about the environment, WeWood is a world champion. When you purchase a WeWood watch, WeWood plants a new tree. In partnership with tree-planting non-profit organizations like Trees For The Future and American Forests, WeWood are making a difference. Each WeWood watch review you will see that sustainability is the key theme behind the creation of every watch. No wonder WeWood Watches are unmatchable when it comes to being environmentally friendly. 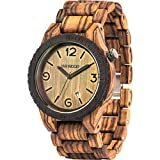 So everytime you buy a WeWood watch or recommend a friend or loved one to do so, you can be rest assured you have also contributed in helping to eliminate environmental harm as well as getting a wonderful new watch to wear every day. WeWood Watches reviews has has not seen listed the WeWood company founders on their official website, however after reviewing the official trademark filing shows that the brand was developed by Alessandro Rosano, Daniele Guidi, and Emma Bogren. Further research has confirmed that the original company was named FratelliDiversi. WeWood watches reviews notes that the WeWood watch company has set a target to plant 1 million trees. In 2010, WeWood was able to plant 7,000 trees with and since 2011, WeWood has planted over 420,000 trees and plans to reach their target by 2020. Pretty impressive for a watch company hey? These guys at WeWood wants to keep you as happy and healthy as possible when you buy one of their creations as well as contributing to the sustainability of the forests that they are working to preserve. In all effects when you wear a WeWood watch and look at the time you get a constant reminder that you’re helping with this sustainability effort. 4 Are WeWood Watches any Good? 5 How are WeWood Watches Made? 6 What kind of Warranty do WeWood Watches offer? 7 Price range of WeWood Watches? WeWood prides itself on using exotic hardwood remnants from all over the world so that each timepiece is unique with it’s own peculiar colour, smell and special characteristics, making them a perfect and one of a kind accessory for any outfit and any look. WeWood watches can be further customized by engraving the watches with for exampl a personal message or declaration of friendship and love. The WeWood watch collection is completely toxin-FREE and artificial materials-FREE and are really lightweight as they are made from 100% wood. WeWood has initiated in collaboration with nonprofit partner organizations such Trees for the Future and American Forests to plant a tree for every watch sold. The WeWOOD collection of wooden watches are created with a combination of style, luxury, and environmental responsibility. WeWood wrist watches are a refletion of the timeless flowing beauty of the Tuscan landscape coupled with the great cultural and artistic heritage of Florence. It goes without saying that naturally all WeWood watches are designed with high attention to detail and an eco-conscious mind-set. Are WeWood Watches any Good? WeWood watches have built a reputation for being a high quality timepiece. Many WeWood watches reviews from various publications seem to concur that WeWood are worth taking a serious look at. We have noticed when anything regarding quality has turned up, WeWood have been very proactive in solving the problem with the watch and responding to any issues promptly and satisfactorily. Overall WeWood users are saying that they love their WeWood watch. Complaints concerning WeWood watches are quite rare from a quality perspective. Most of the complaints that we came accross concern purchases made through online stores where customers wanted to return an unworn or unwanted watch received as a gift. The company policy of WeWood is to not accept a direct return for a refund. As these are wooden watches, there might occasionally be an issue with rough handling during the shipping process. In this case we highly recommend using Amazon as the sales provider of WeWood watches. With Amazon’s return guarantees and especially when combined with their payment guarantees from their partners, purchases will be covered in the unlikely event that something happens to your new wooden watch before you are able to wear it. How are WeWood Watches Made? WeWood watches incorporate Japanese Miyota movements within every timepiece manufactured. The watch components are then manufactured in Indonesia and China. The components of every WeWood watch are hand-assembled in California. California has many strict regulations that govern the use of wooden products including Proposition 65 and WeWood always meets or exceeds these regulations. Every component of a WeWood watch is made from wood with exception to the pins, clasp, battery, glass, and movement. Different wood grains are used to create the various colours and shades of the watches. No dyes are used to change the colour of the wood. Furthermore each WeWood watch is also hypo-allergenic and never treated with chemicals. Naturally these types of watches cannot be expected to be water-proof. What kind of Warranty do WeWood Watches offer? With every purchase of a WeWood watch, customers receive up to a limited 2 year warranty which covers manufacturing defects with materials or with the craftsmanship of the watch. However consumers themselves do need to take a proactive care approach to ensure the wooden components of the watch remain healthy. For US customers at the time of purchase, WeWood also offers the opportunity to add an additional 1 year to the Free Peace of Mind warranty for an added $10. For more information about this warranty or to see if you qualify, you can contact WeWood customer service at support@us.we-wood.com or by phone (909) 799-7940. Price range of WeWood Watches? WeWood watches are probably one of the best wooden watches manufacturers in the watchmaking industry today. Their wooden watch collections are all-natural, sustainable and help you to make the specific fashion statement you want to make. WeWood Watches are priced in the $150 range for most of their collections. This is a watch investment as well as an ecological one that makes sense if you’re looking for a unique watch and love the idea of helping the environment at the same time. Take a look through each WeWood watch review carefully to find the most perfect wooden watch to take with you wherever you go. Here is the new WatchiWatches latest Top Watch Brands Review featuring the Best WeWood Watch Review for worldwide Wood Watch enthusiasts. Lets start by summarizing for you the pros and cons from the best WeWood Watch Review. Then please check the various WeWood Watch review models available in the list with AMZ Reviews. You can also click into each Amazon Review to get first hand reviews from actual WeWood Watch Review Watch users. Hopefully the Best WeWood Watch Review with Top Rated Reviews will help you choose the best WeWood Watch smartwatch for your style and budget. We have given you the main pros and cons to help you shortlist your favourite selection of wood watches. Why not check the latest offers with great deals from the WeWood Watches Reviews with door to door Shipping all around the world no matter where you are! 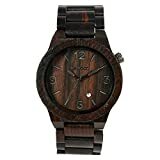 WatchiWatches hopes you have benefitted from the Best WeWood Watches Reviews and have been able to choose the most suitable wood watch from this exclusive wooden watches reviews collection to help enhance your personality and styling. Another WeWood watch review can be viewed before making your purchase decision.